Not to be confused with World 6-6. Area 6-6 is the sixth course of Cosmic Adventure and the fifty-first course overall in Mario vs. Donkey Kong: Mini-Land Mayhem!. The level features two Mini Marios, though not exactly in the same starting positions. One Mini Mario begins at the bottom left while the other begins at the top left, with the exit door at the top right. In order to reach it, they must simply be guided via a series of Blockers, Magnet Blocks and Magnet Rods to it, while watching out for Magnet Sparkies. The M-Token is located at the bottom right, next a Magnet Block platform and atop a Spike Trap. 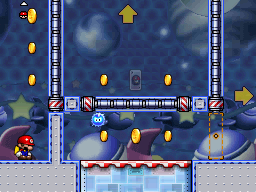 To collect it, a Mini Mario must traverse the the right Magnet Rod platform from the left, then collect it while making sure that the bottom right Blocker is active. The Mini Mario Card is located near the bottom left, atop a Magnet Rod on the lower level. A Mini Mario must down from one of the neighboring Magnet Rod platforms to reach it. In order to earn a trophy, the player must score 15800 points. This page was last edited on September 18, 2018, at 06:23.